Bertha is a 14 year old spayed female terrier mix who was referred for acupuncture due to lack of response to traditional medical treatment. On myofascial exam, she was found to have neck and back pain that was affecting her mobility, comfort, and quality of life. She began responding after two acupuncture treatments and was back to climbing stairs and going for long walks after four sessions. 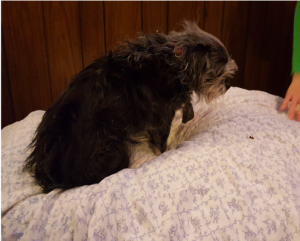 Bertha is a 14 year old spayed female terrier mix who was referred for acupuncture due to lack of desire to climb stairs and shifting leg front limb lameness for 2 weeks. She was seen at her referring veterinarian, who made a presumptive diagnosis of front limb pain resulting in shifting front limb lameness. Bertha was placed on oral meloxicam and showed little to no response. The referring veterinarian performed bloodwork, which was normal, and hind limb radiographs which showed evidence of mild osteoarthritis in hips and knees (OA). She has a history of patellar laxity, severe dental disease, and a heart murmur (3-4/6 systolic). She has not had any major illnesses or surgeries and is not being treated for her heart murmur as it is non-symptomatic at this time. She goes upstairs to sleep with Ms. Heerdt, so when she refused, Ms. Heerdt knew she was uncomfortable. Physical exam findings confirmed a heart murmur, severe dental disease and patellar laxity. Bertha walked around with a rounded back and head facing downward. Her conscious proprioception, and brief neurological exam were normal except that her normal gait was shortened. She was reluctant to dorsoflex her neck when called or offered a treat. Mysofascial examination yielded tight bands of muscle ans connective tissue in her cervical spine and tight ropey bands on her lateral neck. Her entire back was tense. I arrived at my acupuncture approach based upon: pain found on myofascial palpation, body posture, and nervousness of patient. Initially, I wanted to increase relaxation and homeostasis and make the patient feel comfortable with her acupuncture treatments. I also wanted to target the cervical spinal nerves to reduce nociceptive signals via the Gate theory and deactivate specific trigger points in tight muscles by reducing erratic and dysfunctional firing of neurons. E- Endocrine and metabolic disorders are possible but less likely due to normal bloodwork. M- Myofascial tension is present and likely secondary to pain elsewhere or compensatory movements. Cervical spinal pain is likely the cause of Bertha’s hunched body position and reluctance to dorsoflex, which is also likely why she is unwilling to ascend or descend stairs. She also has dental disease, cardiac disease, patellar laxity, and osteoarthritis (OA). I performed 4 treatments on Bertha, since she was nervous about me handling her, I started very slowly and was not able to address all regions of interest every session. Myofascial exam revealed reluctance to dorsoflex, hunched body position, a shortened gait, taught bands of tension in dorsolateral neck. Additional history and exam findings and history are listed above. I began with gentle effleurage and by placing some calming, homeostatic points at Governor Vessel (GV) 20, GV 14, and Bai Hui. I chose these points to target the autonomic nervous system (ANS). I placed Bladder (BL) 54 bilaterally to affect peripheral hip and stifle pain from osteoarthritis and because she seemed anxious about me being near her head and face. She allowed me to place Stomach (ST) 36 bilaterally, which would activate the ANS for homeostasis and peripheral nerve activation for her hind limb OA. She began to calm down and I placed BL 10 bilaterally to speak to her cervical spinal nerves and reduce myofascial discomfort in the area. The BL 10 points may have also helped with headache associated with dental disease. I was also able to place BL 15 bilaterally, targeting anxiety, heart problems and shoulder discomfort. I placed two points in her dorsolateral neck to target trigger points. All needles used were 15mm 0.16 J-type Seirin needles and stayed in the patient for approximately 25 minutes. I chose these needles because they were small, coated, and it was her first time receiving acupuncture. After needles were removed I gently massaged Bertha’s neck and other paraspinal muscles. I instructed the owner to do the same at home. Bertha seemed relaxed after the previous treatment for the remainder of the day and seemed to sleep well. She was still reluctant to go up or down stairs and go for long walks but was no longer limping on her front limbs at home per Ms. Heerdt. Ms. Heerdt had been performing the back massages at home. On myofascial exam, Bertha was still reluctant to dorsoflex and had hunched body position, but was slightly less rounded and her gait was still shortened. She had tight ropey bands in her lateral neck muscles, more predominant in the left and myofascial tension in her thoraco-lumbar para-spinal region. I performed gentle effleurage and placed GV 20, GV 14, Bai Hui, BL 10 and trigger points in the neck for the same rationale as I used in the 1st treatments. I decided to focus on her thoraco-lumbar pain by placing BL 19, 20, and 21 bilaterally to target myofascial discomfort and the spinal nerves in that region. The right side BL 21 was very uncomfortable and remained uncomfortable so I removed it. She seemed nervous again after that placement, so I decided not to place additional needles during this session. She relaxed for about 25 minutes and fell asleep with the owner before I removed the needles. During a gentle massage after the session her myofascia seemed looser and more relaxed especially in her thoraco-lumbar region. During this session I used 30mm 0.2 J-type Seirins. I chose these needles because they were slightly larger and still coated. Bertha slept well after her last treatment and began going up and down stairs. She was able to go on some moderate length walks with the owner and the limping was still gone. Ms. Heerdt had been continuing to perform the back massages at home. On myofascial exam Bertha was still tight with ropey bands in her thoraco-lumbar and cervical regions. She was reluctant to look upward normally but had improved greatly from last week. Her body position was less hunched and almost normal. I performed gentle effleurage and placed GV 20, GV 14, Bai Hui, BL 10 and trigger points in the neck for the same rationale as I used in the 1st and 2nd treatments. I wanted to focus on the thoraco-lumbar region again since it seemed uncomfortable for Bertha and that we were getting good results from targeting it. I placed BL 21 and BL22, but Bertha began getting very nervous after placing BL 22, so I did not place any more needles. I used 30 mm 0.2 J-type Seirins again and left them in for 25 minutes. I massaged her neck and paraspinal muscles afterward and her neck still felt tight, but her thoraco-lumbar region was more relaxed. Bertha did well since the last treatment and was doing stairs and going for walks. Ms. Heerdt had been continuing to perform the back massages at home and Bertha was responding well. On myofascial exam, she still had some myofascial tension in her neck but far less than previous treatments. Ropey bands and tension were mostly in the paraspinal muscles of her thoraco-lumbar region. She was willing to dorseflex and the position of her back was almost normal. I performed gentle effleurage and placed GV 20, GV 14, Bai Hui, BL 10 and trigger points in the neck for the same rationale as I used in the previous treatments. I wanted to focus on the thoraco-lumbar region again since it seemed uncomfortable for Bertha and that we were getting good results from targeting it. I placed BL 19, 20, 21 and 22 and did not notice any particularly reactive points for her as I did in previous sessions. I used 30 mm 0.2 J-type Seirins again and left them in for 25 minutes while she fell asleep with the owner holding her. We discussed treatment of Bertha’s dental disease and continued treatments as necessary. Bertha was a very nervous dog when I began treating her. If we went too far or she began seeming fearful we would end the session and let her rest. This was probably due to her chronic pain and potentially bad experiences with physical examinations. She seemed to respond well to my “make friends” points at GV 20, 14 and Bai Hui by visibly becoming more relaxed, so I always placed these first. It was evident that she had significant cervical and thoraco-lumbar pain, so I chose to focus most of my efforts in these areas. Both seemed to respond well to treatments. Ms. Heerdt and I were able to measure outcomes by discussing her activities at home and by body posture observation during examinations. Prior to treatment, Bertha was intermittently limping on her front limbs, would not dorsoflex, and walked in a hunched over position. She was unwilling to go for moderate or longer walks and refused stairs. As the treatments progressed, her lameness was reduced and finally disappeared. She began using the stairs and allowing longer walks. Identifying and focusing on the thoraco-lumbar region helped her a lot. We discussed possible future dental care, but finances and Bertha’s heart condition were of concern. We also discussed the continued use of meloxicam as needed. The only adverse event occurred was when I placed the painful needle at BL21 during the treatment of 11-29 and she cried out. While I do think this helped her, it would have been better to place smaller needles in that area if it was so sensitive. Throughout this case I learned how important it is to help the client watch for improvement in his or her pet. If the client can see improvement, they are more likely to continue the helpful therapy. When I was speaking with Ms. Heerdt about the past week she would say “well, there doesn’t seem to have been any change” and I would ask specifically about stair use, length of walks, body position and sleeping, and she would realize that some of those things had actually changed. It would be helpful to have an MRI for cases like Bertha as a confirmatory diagnosis, but this is rarely the case in private practice. She has many health concerns, which is normal for an older patient, but that also reduce her value as a case report for research. She had noticeable improvements with acupuncture, and maybe have improved even more had we tried it in conjunction with other modalities such as laser or electro-acupuncture.